GREAT SHOWDOWNS PRINTS!!! — Scott C.
I HAVE SOME VERY EXCITING NEWS, YOU GUYS!! As some of you may know, i have returned to creating new GREAT SHOWDOWNS. It's good to be back. I love it. As some of you may also know, i've been releasing Great Showdowns toys with DKE Toys. A new one with drop on you at San Diego Comic Con. 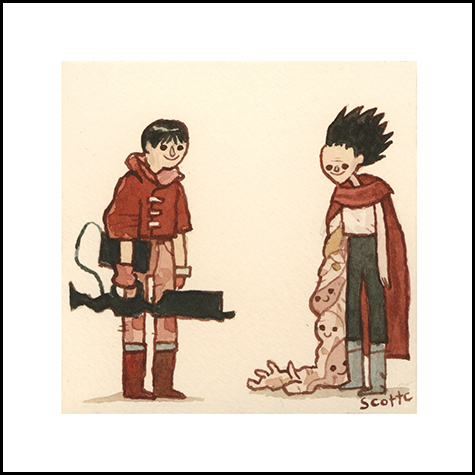 But TOMORROW, May 30th at 2pm EST, we will be releasing NEW GREAT SHOWDOWNS PRINTS in TheScottCShop! That's right. We will be releasing 3 new prints along with a special hidden print. In addition to these three showdowns I will be making a very small print edition of this little guy and putting them in 20 random in orders! A little surprise for you guys! They won't be for sale at all, just appearing in 20 lucky orders! Like golden tickets. Except there is no candy factory tour. In addition to the new prints, we have some exciting news that is going to make a lot of the international folks happy. We have teamed up with an international shipping consolidator which will allow us to offer some really amazing discounts on shipping fees. At this time regions are limited, but if you qualify, the "International Economy Rate" option will be visible at checkout along with standard USPS rates. Please note these orders will be processed slightly different than our normal shipments as they are picked up once a week and there is a small .50 handling fee assessed by the consolidator. Delivery times will be about the same as USPS. Our first Great Showdowns toy with DKE has been nominated for a Designer Toy Award! I am crazy excited and flattered about it! GO check out all the nominees! The winners will be announced at the 8th Annual Designer Toy Award Gala in Brooklyn on Friday June 1st! I wish i could attend, but i just moved to LA. My NYC studio was right next to Brooklyn Bazaar. Oh, the luck. But anyway, i am proud of the gang at DKE Toys for making such a wonderful toy! Thank you, Dov and George! !